There so many micro breweries on the market. Each has their own taste and ways to attract customers. Some of these labels come with fancy bottles, while some have flashy ads. All these to make sure their products become the first choice for most drinkers. But there’s no better way to make a great first impression by having a custom beer tap to entice your customers. With the custom beer tap, you’ll be able to make your finely crafted brews stand out from the rest. By making a creative design, customers will be able to take notice. With pubs having several draft beers on tap accessible to customers, the competition becomes more fierce. That’s why it’s best to be able to appeal to the customers even at the point of sales. Unlike billboards and commercials, the custom beer tap lets you interact with people at a personal level. This means that you get to take a more engaging approach to show how your brews are different than other beers. An approach that one of UK’s famous brand was able to present. 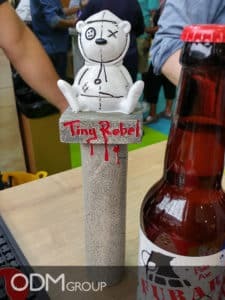 By creating a unique pull tap handle, Tiny Rebel was able to create a fun and exciting representation of their beverage. On top of that, they’ve made sure that their loyal drinkers are able to find their way to their beer by adding their cute mascot in it. You can find more than 600 case studies around beer on our blog and we even built www.beerpromos.com to promote some of our unique items. I still rate the coolzee very highly and its a product ODM put a lot of work into. New samples of Coolzee now available. Why we love drinks promo idea – custom beer tap? Brand awareness. With the custom beer tap, you’ll be able to set a better outlook for your brand to make you more distinguishable and interesting to others. Enhances brand visibility. Having a creative beer tap handle, you’ll be able to have your beers more identifiable to existing customers. Attract customers. Not only does this work with your faithful aficionados, but it also encourages others to try your beer. Boost sales. Being able to expand and maintain your market, you’ll be able to expect positive numbers in sales and profit. Finer brand remembrance. With a unique beer tap for customers to see, people are sure to remember your products as a fun and enjoying. The beer industry has always been an active place for businesses to showcase their selections of tasty beverages. To ensure these companies become the best, they continue to make more aggressive strategies to take a big slice of the market. Therefore, it’s best to have a clever game plan of your own. With this in mind, making use of a creative custom beer tap has never been more important. Looking to have one of your own? Do get in touch with us so our team can help you out and also give you a quotation.